Photographs taken since May 2013 are held on Flickr. Photos from June 2012 to April 2013 can be found on Picasa. Click on the image or link to go direct to the specific album. Photos pre June 2012 are held in our own webspace. Click on an image to enlarge it. Paul Robinson, Tom Harker and Mark Povey who were awarded the rank of 4th kyu at the Taisai on 28th April. who demonstrated the standard required and were awarded the grade of 5th Kyu. of Wellsprings Aikido who demonstrated the standard required and was awarded the grade of 5th Kyu. 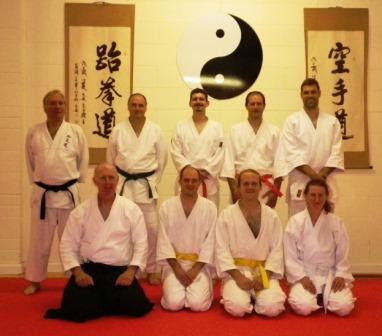 of Wellsprings Aikido (centre) who demonstrated the standard required and was awarded the grade of 4th Kyu. 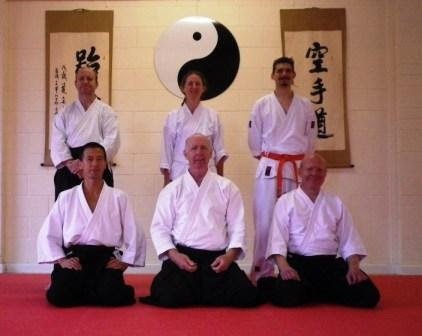 In June 2010 the Doshu, Ueshiba Moriteru Sensei, grandson of the founder and his son, Waka Sensei, visited Cardiff. This was the Doshu's first visit to the U.K. and the event was attended by 800 aikidoka. You can view lots more photos on the event website.